The next winter sketch is complete and has now been framed. Apologies for the poor photo - the gold colour on the water-gilding is a reflection of a cream wall but in reality it all appears silver (12K white gold). This painting, along with the previous winter sketch that I posted a few days ago, are destined for the Affiliates Exhibition at the Nottingham Society of Artists which runs from Thursday 9th to Wednesday 15th of February. The first winter sketch has been framed in a brown off-the-shelf moulding that I had leftover from a previous job and I think it suits the picture rather well. The final painting of the three I will be exhibiting next week is a small study of a stream at Tickhill near Doncaster which I have framed in another hand-gilded frame, this time using 22K gold. A return to my normal fare today. This winter landscape sketch was based on a photograph I took last winter. For Nottingham folk that might be interested these are the fields at the bottom of Netherfield looking towards Radcliffe. I am working on a couple of other small panels based on this winter theme and I will probably be posting these within the next couple of weeks. 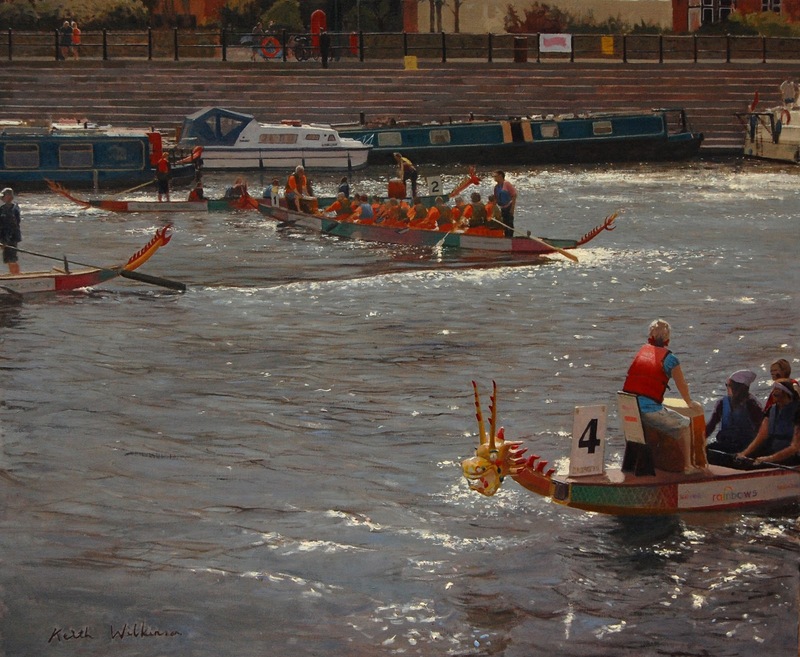 I am absolutely over the moon to announce that the dragon boat painting, which I eventually called" Sparkling Light - Nottingham Riverside Festival", was awarded the Holbrook Trust first prize at the Nottingham Society of Artists Autumn Exhibition. The Dragon boat painting is finally finished and has been handed in at the Nottingham Society of Artists ready for the Autumn Exhibition which starts on Tuesday. I was going to gild a frame but time and finances got in the way. I did however have time to gild a frame for my other submission, a much smaller picture, " Early Morning Light - Jim's Garden". Not far of the finishing line! It hasn't turned out as I initially thought but they never do. The major change since the last post is that I have glazed over everything (apart from the highlights) to lower the tone. I was trying to recreate my initial impression on first seeing the subject of how dark everything appeared when the sunlight reflected off the water. 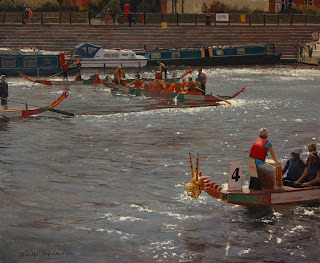 I have a bit more to do to clarify some of the figures on the centre boat but after that It would be wise to call it a day. I will post a final picture after it has been framed. 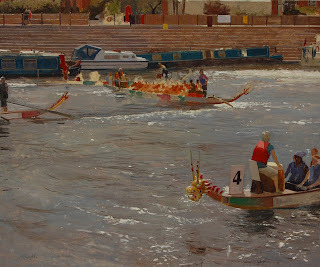 Current state of play with the dragon boat picture. I have been working back and forth between the water and the boat in the middle distance today. I reckon there is at least a couple more days of work yet. I am considering attempting to unify some of hues in the water with some glazes but I'm not sure yet. I'm having a break from the dragon boat picture whilst it dries so I thought I would dig out my watercolours and have a go. 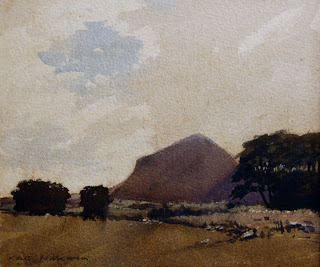 It must be two years since I picked up a watercolour brush in anger - now I know why. They are so difficult. It doesn't help that I can't seem to make my mind up whether they should be built up wash upon wash to reach the desired tone or whether they should be more spontaneous and more direct. This small watercolour of Ben Bulben has got a bit overworked I feel. I might have another go and try to reach the tones in fewer washes.